So as it was my child free weekend I had planned on just staying home, relaxing and catching up on some writing, but when I was invited up to Street Feast I was like Food? Drink? HELL YEAH!! I’d actually heard about this last summer and never managed to reach so I was very eager to go and experience it this year. 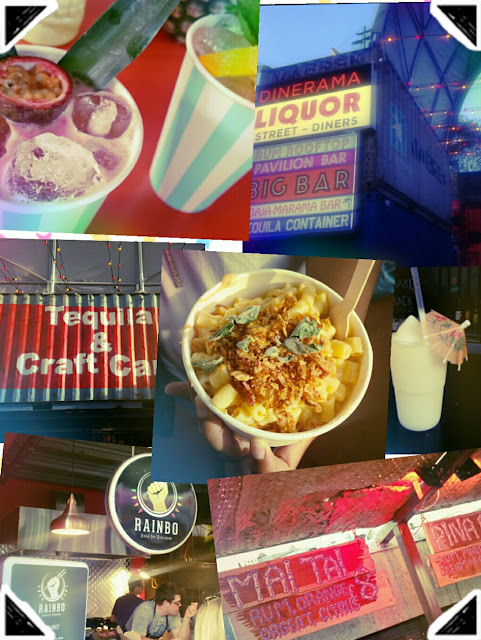 OK, so Street Feast is basically an outdoor food market in London where you can go and try lots of interesting new foods that might not normally be available to you. Me and my girls went to Dinerama in Shoreditch but they have the same event in Dalston and Lewisham. I had such a lovely time. It was a good vibe and full of the usual Shoreditch trendies as well as tasty food and amazing cocktails. One of my girls tried the Lobster Mac’n’Cheese which was lovely and I tried the duck wrap from Duck n Roll as for some reason I was craving duck and also wanted something I knew wouldn’t upset my stomach and ruin my evening. There was also an upstairs area where most of the bars were that had a fake lawn area to give a vibe of a beer garden. I tried the Big Kahuna cocktail which had rum and was very fruity. I also loved how the barmen poured freehand and didn’t bother with them crappy measuring cups, so when I later had a rum and cranberry it had a real kick! I also had some tequila slushies which looked pretty sweet and innocent but packed quite a punch. I had maybe 2 or 3 and I was good after that. Also as well as eating and drinking people were just hanging out as they had a DJ who played the kinda music you would hear on Solar FM and I love Solar FM me and the kids listen to it everyday while we eat dinner so I enjoyed it and had a little dance. But then I probably would’ve danced to the sound of a pin dropping after all those bloody slushies. But I had a wicked time we stayed till around 11ish and the place was still full when we left. Oh also did I say it was free (before 7 I think) obviously you have to pay for the food etc, so you don’t have to spend a tonne of money and you know me I’m all about saving money and being frugal. But I’m soo glad I decided against being a boring old fart and came out, now I can’t wait till our next adventure. Mummy why cant I go outside? Do you really need a kids club? When was the last time you was you?